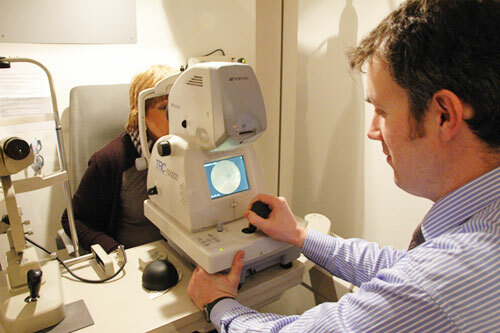 As Optometrists our main role is to test the eye for visual error which may be corrected by spectacles or contact lenses aswell as screening for eye problems which may not be correctable by simply putting on a pair a of glasses ie conditions that may require further medical investigations (eg glaucoma). The following tests are performed as standard during the eye test. At Infocus Opticans we are fortunate to have a resident Ophthalmologist working out of our Portlaoise practice. Mr Tom Stumpf is a consultant surgeon with expertise in areas such as cataract surgery. Should a case arise where we feel further investigations are necessary we can facilitate a prompt referral. The critical age for a child’s visual development is from birth to age nine. At Infocus Opticians we are more than happy to examine children. The various essential tests are performed eg checking for “lazy” eyes or testing for misalignment between the eyes. Uncorrected vision in a child can seriously impact on a child’s development so early detection of possible visual anomalies is essential. Parents should be aware that in cases where there is family history of eye problems that sight testing should be a priority. Remember corrective eyewear resulting from the eye exam can sometimes be part only part of the solution, changing factors such as health, workplace, lighting and diet may be required which we are more than happy to advise on. Any individual possessing a medical card or pays full PRSI contributions is entitled to a free Eye-test every 2 years. To drive you must meet certain medical fitness standards and your eye sight is one of those standards that needs to be tested.We provide this service for anyone applying or renewing their licence. We also provide the extra tests that are required to be carried out if you are applying for a truck or bus licence (Group 2). A more detailed visual field test is necessary, as the standard of vision needed is higher in this category.